Recently our family welcomed two new furry family members, Archer and Lucy. After the first few nights, weeks and now months of taken care of Archer and Lucy reminded me of many things. You must puppy proof the house; puppy teeth are sharp and will shred anything and strange enough how dreams are like puppies. Both require a lot of work and it is easy to see the mature dog/dream and look past the work that it took. decision with the information we had at the time. If we didn’t act our puppies would still be a dream and not new cherished members of the family. Sure, we could have continued to research and study our options leading to paralysis by analysis. Where you tell yourself you need to continue to study or everything must be perfect for your dream to come true. In this case, we would have continued to imagine puppies, but we would have never actually added them to our family. Dreams are messy and will never be perfect, but can be perfectly acted on. 1 This is the first way that dreams are like puppies. You see we often visualize our dreams, but rarely do we move past the research and study stage. Instead we become frozen by the fear and the what if game. Our minds allow us to see how terrible it would be if our dreams failed or if they came true. We never move out of the study stage. 2 With a family of five we had to have a shared agreement to bring a new member into the house. While we needed to compromise about bringing a new puppy into the house it was not a unanimous decision. Our son with autism wasn’t super stoked about a new puppy and the rest of the family would struggle with picking out Archer as a name, how to best train, could they be on the couch or did they have to stay off the couch etc. This is the second way dreams are like puppies. Too often we look for everyone to give their 100% approval to our dreams, that is not needed. Your dream is your dream, not mine. When you look for unanimous support you will find complete frustration. Instead look for structured support for your dreams. We didn’t all agree on every aspect of the puppies and we may not in the future, but we all agreed to support each other with potty training, walking him, and providing a safe place for him to grow. 3 Puppies have a lot of energy and Archer is a high-energy dog, he is basically the dog version of me. You must exercise them allowing them to reach their full potential as companions and so they don’t destroy your house. You guessed it this is the third way dreams are like puppies. If you don’t exercise your dreams they will become bored and rattle around in your mind for a while and eventually will start to destroy your house. Most dreams need to find an outlet so you can exercise them, take them for a walk or play catch with them, but if you only want your dreams to sleep they will bite you. 4 Puppies need the proper food, love, and environment to grow from healthy happy puppies into awesome adult dogs. Puppies require a truckload of work. Dreams need all these things to flourish as well. Especially the work portion you should work with your dreams. When it comes to dreams, we give up because often dreams resemble work. They don’t just magically happen; we must work at them train them on what and where we want to go. If we don’t we will have a wild energetic dream that just chases its own tail. 5 Puppies will test your patience, grit, and ability to love unconditionally. They will often chew on things you value even though there is a perfectly good puppy toy right next to your favorite pair of shoes. You will be exhausted and questions if you can do this puppy thing at times. I know that comparing dreams to puppies might appear to be an odd comparison, but they both are work wrapped in passion. 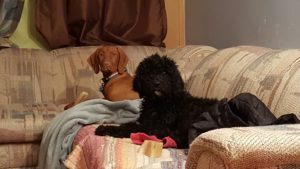 Archer and Lucy are growing quickly and with the proper food, exercise, and love your dream will do the same if nurtured. Lastly, no matter how well behaved your puppy is, there will be a time where they poop, pee, chew up your favorite shoe or rip your pillow apart because they can. Just clean it up and make sure you learn from the mess they leave. Dreams also can make your life messy, learn from the mistakes and keep pushing forward.